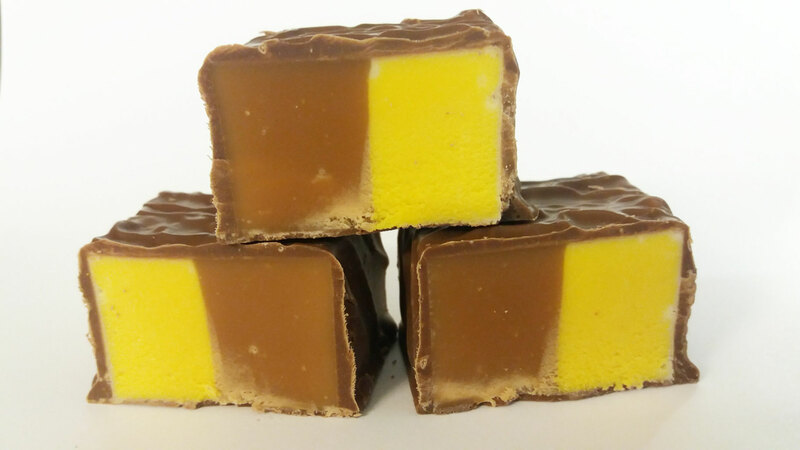 Our Fudge & Marzipan Nougat Slice is one of our delicious Christmas sellers. One layer is with Soft Caramel and the other layer is with Marzipan Soft Nougat, all covered with Milk Chocolate. Sugar, Glucose Syrup, Milk Chocolate 20% (Sugar, Cocoa Butter, Milk Solids, Cocoa Mass, Whey (Milk) Powder, Emulsifier: Soya Lecithin), Full Cream Milk, Non Hydrogenated Vegetable Fat (Palm Oil, Palm Kernel Oil), Cornflour, Egg White, Natural Flavouring, Natural Colour: E161b, Preservative: Citric Acid. Milk Chocolate contains: Cocoa Solids 25% min, Milk Solids 14% min. Our lemon soft nougat flake is genuine English soft nougat. 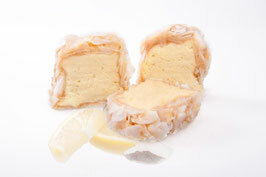 It is flavoured with lemon and then dipped in soft chewy toffee and rolled in Desiccated coconut flakes. Sugar, Glucose Syrup, Chip Coconut, Full Cream Milk, Non Hydrogenated Vegetable Fat, Coconut, Egg White, Cornflour, Preservative: Citric Acid, Natural Flavouring, Natural Colour: E161b. 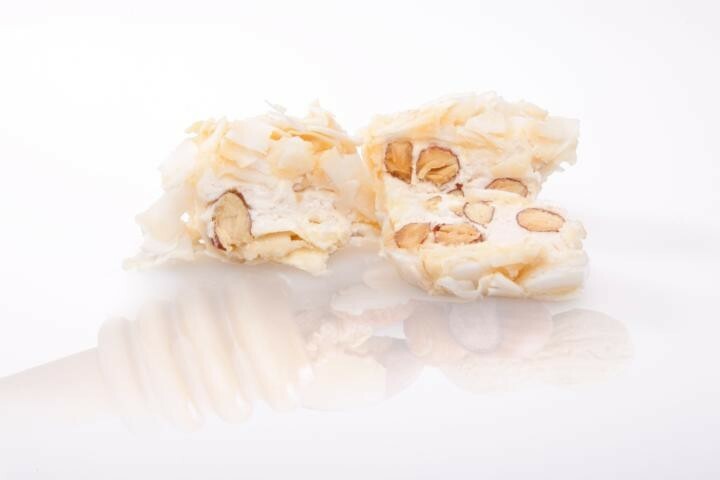 Our Honey and Nut Soft Nougat, is a soft and chewy white English nougat with added honey and mixed nuts. 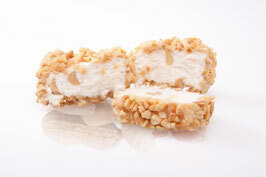 The honey nut nougat is then dipped in honey flavoured caramel and hand rolled in flakes of desiccated coconut. Sugar, Glucose, Cornflour, Chip Coconut, Roasted Peanuts, Honey (3%), Almonds, Non Hydrogenated Vegetable Fat, Gelling Agent: Beef Gelatine, Preservative: E330, Flavouring. 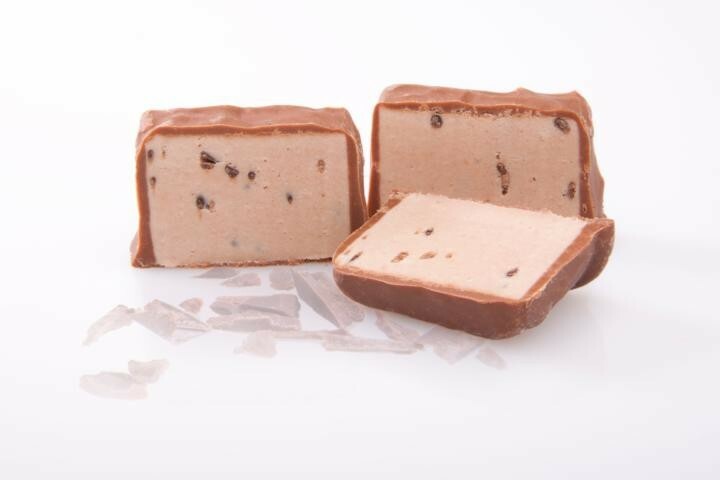 Our Chocolate Chip Soft Nougat, is a chocolate flavoured English soft and chewy nougat with added chocolate chips and covered in a rich melted milk chocolate coating. Sugar, Glucose, Milk Chocolate (Sugar, Cocoa Butter, Milk solids, Cocoa Mass, Whey (Milk) Powder, Emulsifier: Soya Lecithin; Natural Flavouring), Cornflour, Non Hydrogenated Vegetable Fat, Chocolate Chip (1%)(Sugar, Cocoa Powder, Glucose Syrup, Non Hydrogenated Vegetable Fat), Cocoa Powder, Gelling agent: Beef Gelatine, Preservative: E330. Milk Chocolate Contains: Cocoa Solids 25% min, Milk solids 14% min. 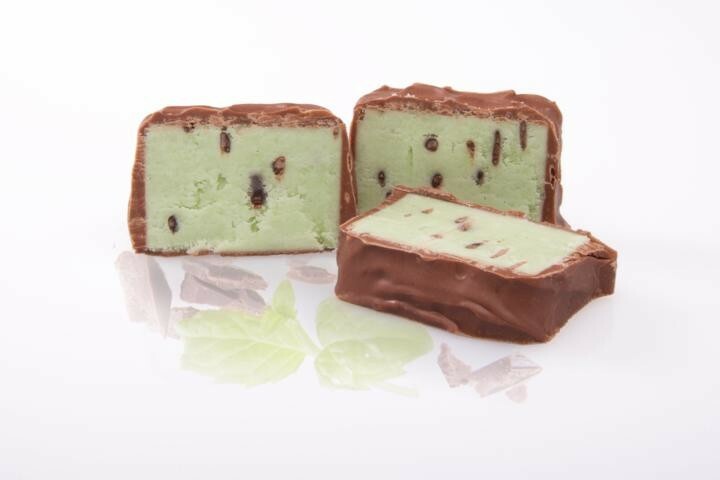 Our Mint and Chocolate Chip Soft Nougat, is a mint flavoured English soft and chewy nougat with added chocolate chips and covered in a rich melted milk chocolate coating. Sugar, Glucose, Milk Chocolate (Sugar, Cocoa Butter, Milk Solids, Cocoa Mass, Whey (Milk) Powder, Emulsifier: Soya Lecithin, Natural Flavouring), Cornflour, Non Hydrogenated Vegetable Fat, Chocolate Chip (1%)(Sugar, Cocoa Powder, Glucose Syrup, Non Hydrogenated Vegetable Fat), Gelling Agent: Beef Gelatine, Preservative: E330, Natural Flavouring, Natural Colours: E100, E141. Our soft Nougat Sundae is an authentic English soft and chewy white nougat. 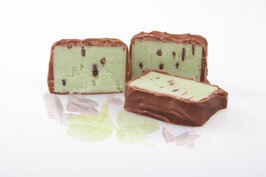 We add extra honey, candied cherries and nuts and then cover it in a coating of fudge and crushed dry roasted peanuts. Roasted Peanuts, Sugar, Glucose Syrup, Full Cream Milk, Glace Cherries, Non Hydrogenated Vegetable Fat, Coconut, Egg White, Natural Flavouring, Acidity Regulator: Citric Acid, Colours: E100, E127, E133; Preservatives: E202, E220. 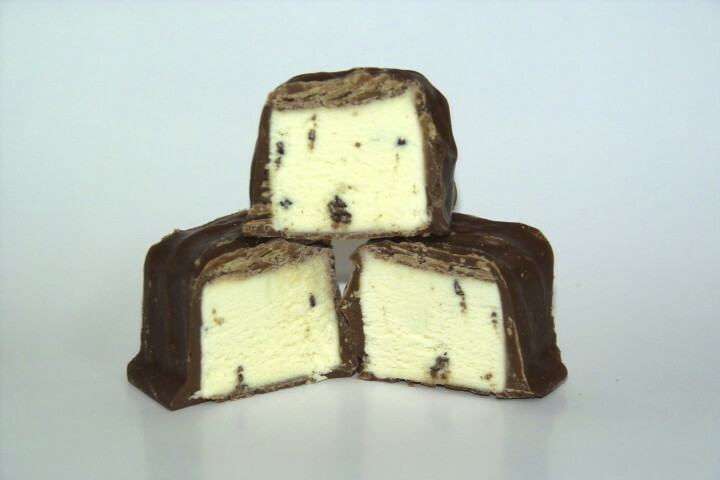 The Stracciatella Soft Nougat has a creamy Stracciatella flavoured filling with chocolate chips in it and is covered in a layer of chocolate. Sugar, Glucose Syrup, Milk Chocolate (Sugar, Cocoa Butter, Milk Solids, Cocoa Mass, Whey (Milk) Powder, Emulsifier: Soya Lecithin, Natural Flavouring), Chocolate Chip (1%) (Sugar, Cocoa Powder, Glucose Syrup, Non Hydrogenated Vegetable Fat), Egg White, Cornflour, Natural Flavouring. 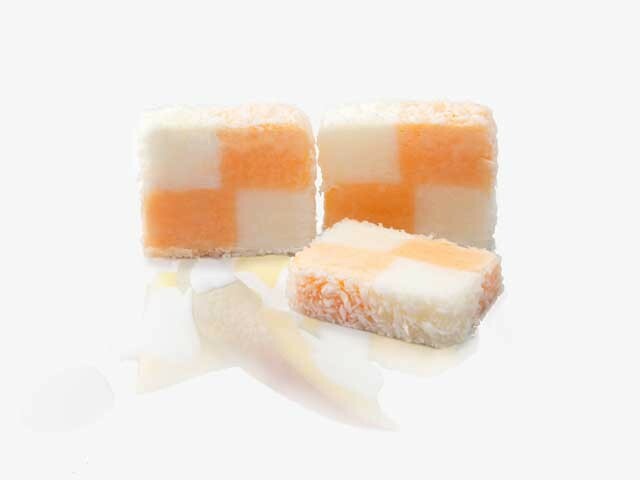 Our mango and yoghurt soft nougat is 2 mini squares of mango soft nougat and 2 mini squares of yogurt soft nougat with a fine coat of designated coconut flakes. 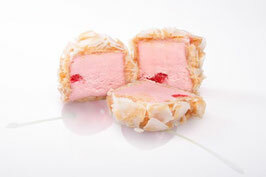 Sugar, Glucose Syrup, Cornflour, Coconut, Non Hydrogenated Vegetable Fat, Gelling Agent: Beef Gelatine, Flavours, Colour: E160c. 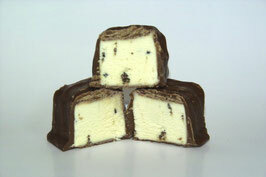 Our soft nougat is a soft confectionary made from Sugar and Honey. As it is cooling we flavour it by folding in cherries. We then cover the soft nougat in chewy toffee and roll it in Desiccated coconut flakes. Sugar, Glucose Syrup, Chip Coconut, Glace Cherries (2.4%), Full Cream Milk, Non Hydrogenated Vegetable Fat, Coconut, Egg White, Cornflour, Flavouring, Acidity Regulator: Citric Acid; Colours: E127, E120; Preservatives: E202, E220.